Continuing with Shaara’s Civil War books, which I read in ebook format. Last week I reviewed A Blaze of Glory, about the battle of Shiloh. This time, it’s Grant’s campaign against Confederate General John Pemberton, leading to the South’s loss of the citadel of Vicksburg. As the war in the West turns badly for the South, the Union knows the one great barrier to their control of the Mississippi River, considered critically important, lies at the Confederate bastion of Vicksburg, Mississippi. Protected by high embankments, and a formidable presence of Confederate artillery, the Confederate forces there under the command of John Pemberton, are confident that Vicksburg is a citadel that cannot fall. But Federal commander Ulysses Grant believes otherwise. So Grant launches an overland campaign that avoids a direct frontal assault on the town from the river, and instead, maneuvers his army downstream, crossing from Louisiana into Mississippi where the Confederates are too weak to make an effective stand. 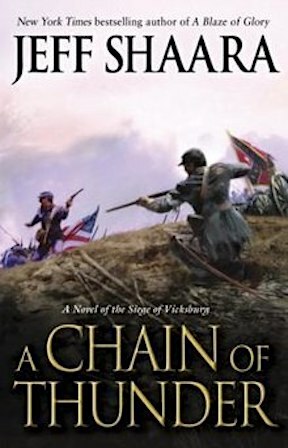 Instead of pushing directly at Vicksburg, Grant employs an audacious strategy, slicing quickly through the Mississippi countryside toward the capital city of Jackson. Pemberton’s superior, General Joseph Johnston arrives in Jackson and sees Pemberton’s situation in Vicksburg as hopeless. Thus he holds his own forces back from the fight, allowing Grant the freedom to focus all his energies on Vicksburg itself. Johnston’s reluctance to engage Grant, and thus offer relief to Vicksburg, is one of the most controversial decisions of the war. Like the first novel, this book is excellent. Next week I’ll be going on to the third book. Richard, thanks for reviewing Jeff Shaara’s Civil War books. My reading of Westerns piqued my interest in the War and I hope I can get to these books soon. These are very good, Prashant, I think you’ll enjoy them. Wow, I’m impressed that you’re knocking off these Big Fat Civil War Books so quickly! George, I could barely put these down, I raced through one after the other, through the first three, then got burned out. I haven’t read the fourth one, but will very soon. If I ever get close to caught up I want to move on to these too. I think you’ll like them, Jeff. I was thinking the same as George, you are really making some headway with those long books. I like the idea of telling some of the story through unknown people, soldiers and civilians, involved in the war.